Making pancakes into cool animals and shapes has become a pretty big trend. 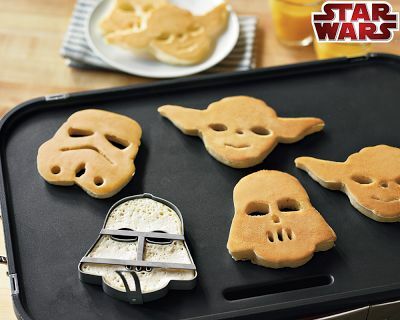 But you will be the coolest pancake maker of them all with these new Star Wars Pancake Molds. Super easy to use (and with lots of bonus holes for syrup! ), these molds are available from your nearest Williams-Sonoma. I popped in today to take a look at these for myself, and saw some Star Wars cookie cutters, a Star Wars apron, and some black, white, and metallic silver sprinkles. Get these as a great gift for Father’s Day, or pick them up for yourself. Eating Star Wars pancakes just gives you an excuse to use your bacon like a lightsaber. Should a Robot Officiate Your Wedding?